REPORT ON Burlington Atomic Energy Week October 25 - November 1, 1947 (The purpose of this report is threefold: to assist other communities in carrying out similar educational campaigns by describing the mechanics and pattern of the project; to indicate the high degree of potential community co-operation, given leadership and educational tools with which to carry out such a jproject; to suggest the extensive need for these tools and the kind required.) Objectives To bring to the people of Burlington (population 35,000) and Des Moines County the basic scientific facts and social implication of atomic energy through an intensive educational campaign in the realization that the alternatives before us are informed action or obliteration. Organization Procedure 1) A meeting was called to which representatives of 30 leading organizations were invited. The League foreign policy chairman spoke on the importance of atomic energy education as a new frame of reference within which all citizens must judge foreign and many domestic policies. The weeks' program, as worked out by the League, was discussed and approved. Agreement was reached on general policy as follows: "Atomic Energy Week in Burlington is to be purely educational stressing over-all facts and problems and recognizing that international control and strong international political organization are essentials but leaving it up to the individual to decide the final, specific answers. The peacetime potentials, as well as the destructive force of atomic energy should be covered by the program. No immediate legislative or political action will be requested." 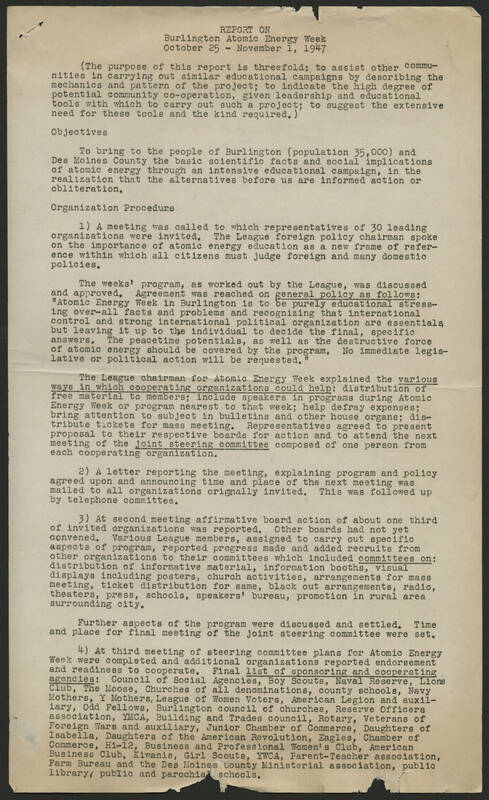 The League chairman for Atomic Energy Week explained the various ways in which cooperating organizations could help: distribution of free material to members; include speakers in programs during Atomic Energy Week or program nearest to that week; help defray expenses; bring attention to subject in bulletins and other and other house organs; distribute tickets for mass meeting. Representatives agreed to present proposal to their respective boards for action and to attend the next meeting of the joint steering committee composed of one person from each cooperating organization. 2) A letter reporting the meeting, explaining program and policy agreed upon and announcing time and place of the next meeting was mailed to all organizations originally invited. This was followed up by telephone committee. 3) At second meeting affirmative boar action of about one third of invited organizations was reported. Other boards had not yet convened. Various League members, assigned to carry out specific aspects of program, reported progress made and added recruits from other organizations to their committees which included committees on: distribution of informative material, information booths, visual displays including posters, church activities, arrangements for mass meeting, ticket distribution for same, black out arrangements, radio, theaters, press, schools, speakers' bureau, promotion in rural areas surrounding city. Further aspects of the program were discussed and settled. Time and place for final meeting of the joint steering committee were set. 4) At third meeting of steering committee plans for Atomic Energy Week were completed and additional organizations reported endorsement and readiness to cooperate. Final list of sponsoring and cooperating agencies: Council of Social Agencies, Boy Scouts, Naval Reserve, Lions Club, The Moose, Churches of all denominations, county schools, Navy Mothers, Y Mothers, League of Women Voters, American Legion and auxiliary, Odd Fellows, Burlington council of churches, Reserve Officers association, YMCA, Building and Trades council, Rotary, Veterans of Foreign Wars and auxiliary, Junior Chamber of Commerce, Daughters of Isabella, Daughters of the American Revolution, Eagles, Chamber of Commerce, Hi-12, Business and Professional Women's Club, American Business Club, Kiwanis, Girl Scouts, YWCA, Parent-Teacher association, Farm Bureau and the Des Moines County Ministerial association, public library, public and parochial schools.